Yep the work week has started for some of us already. What holiday? No problem, I’m up for the task. Been working all my life and proud of it. But yesterday something gave me pause. On my way into work, what looked to be a late-model import was zipping up to Silver Spring and appeared to be in a hurry. There was generous use of all 3 lanes and by the time he got to my side I was already privy to his tactics and true to form he took advantage of the car length in front of me to maybe get ahead. He did but got caught at the same light I did. That is when I pulled the camera from the passenger seat and snapped this one. Well this might be the most apt vanity plate I’ve seen in a while. It’s good to see people trying to live up to their titles in life. I’m sure he or she has provided countless laughs and smirks with the plate and driving talent. But for their sake I hope they don’t run into the guy with the vanity plate that reads “NUTwGUN.” For that combination spells disaster. 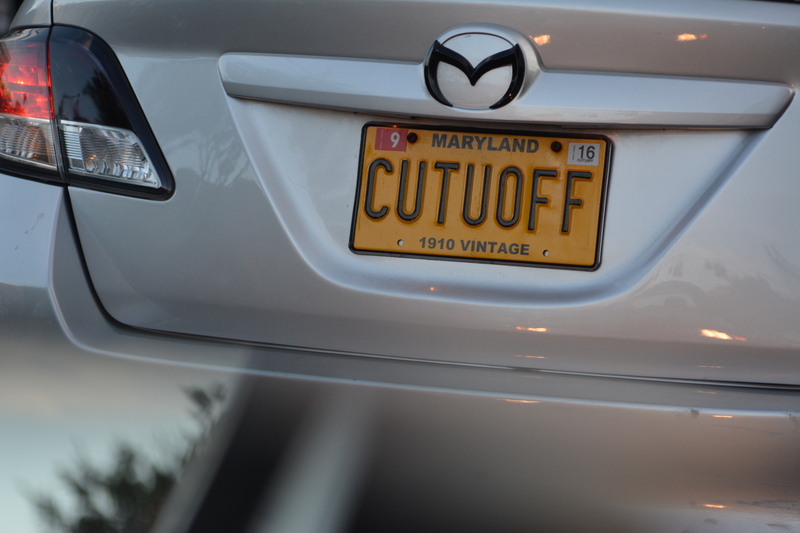 But what really caught my attention is the plate itself also. What is the vintage 1910 doing on a late-model Mazda. At least that is the emblem I believe. Who knows, maybe I’ve missed the point entirely here. No hard feelings, many happy motoring miles my man in this car. I’ve seen far worse driving than his before and will see far worse in the future. I must relate a gratifying experience today. My Son came over and he and his bride to be are gathering pictures of themselves growing up. So the mission was to find pictures of him through the ages. What fun, what memories, what great times. Some of them I had forgotten, but those images brought back that time and feeling immediately. And then I thought to myself. He isn’t going to have photos. He’s going to have a smart phone with a digital library. How sad, nothing to hold or pass around. You can even drop every photo and it doesn’t break. Of course he won’t need the endless shoe boxes to store all those memories. I’m glad I lived through the beginning of the photographic revolution. I can’t wait to sit with a pile of boxes around me filled with photos again. Working on Labor Day, just doesn’t feel right. How can one learn if the mind is shut? Watching people flee for their lives in the middle east, really makes me appreciate all we have in this country. Are you afraid of being told you’re not eligible to own a smart phone? I will never complain about a warm day in September. One of these days, oh yeah tomorrow, I had better get organized.